Metal is among the many materials that are popular to use when constructing roofs. Metal roofs are known for their longevity, lasting between 40 and 70 years, compared to asphalt roofing which typically lasts between 12 and 20 years. 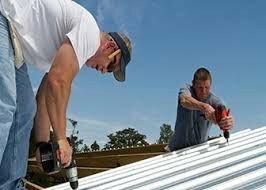 Metal roofs are also highly durable, with some resisting impacts and handling wind gusts that reach 140 miles per hour. Metal roofs additionally do not pose a risk of fire during lightning strikes or wild fires, are energy efficient, and are usually 100% recyclable. If you are considering a metal roof, then you will notice a few key variations. These roofs tend to have standing seams or are screw-down styles. There are also some variations in gauge. Screw-down metal roofs, also known as exposed fastener roofs, involve the panels being fastened to the roof directly through the metal and into the framing or roof deck. The fastener is exposed. Screw-down metal roofs tend to be more affordable than standing seam ones due to their ability to work with lower-quality paint systems, the thinner gauge panels, fewer accessories, and wider panels. They also do not require time-intensive seaming and perform fairly well. Finally, screw-down metal roofs have a traditional appearance that some homeowners prefer. The disadvantages of screw-down metal roofs start with the fact that there are multiple roof penetration points, one at every fastener. There can also be issues related to the fasteners, such as UV degradation and the screw withdrawing as weather changes cause the metal roof to expand and contract over time. The other main type of metal roofing uses a standing seam, which conceals the fastener. This type of roof has vertical legs with broad and flat areas between them. 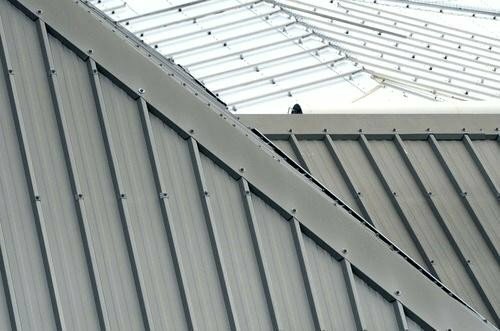 The lack of exposed fasteners is a strong benefit of standing-seam metal roofs since there are no punctures in the roof or risks of things like wind, rain, and UV rays damaging the fasteners. Standing-seam roofs also tend to allow for more thermal movement, require less maintenance than screw-down ones, and last longer. Many people also appear the sleek and modern appearance of these roofs. On the other hand, there are fewer qualified contractors who can install a standing-seam metal roof, the installation process is more labor-intensive, and it costs more. You also cannot use standing seams on a flat roof. In addition to the distinction between standing-seam and screw-down metal roofs, there are differences in terms of the metal gauges used. Gauge refers to the thickness of the panel you use on the metal roofing. A higher gauge number indicates a thinner material. In residential roofing applications, the minimum recommended is 29 gauge, with 26 gauge being suitable for most applications that you will find. The exception is if you live in an area with severe weather, hail, or high winds. In this case, experts suggest going with 24 gauge. Keep in mind that there are some variations in gauge between companies, so you should also look at the decimal thickness or rely on your roofing contractor’s judgement. For more information about metal roofing or to have our team assist you with repairs or replacement, contact Transcendent Roofing today.